Shape-Shifting and journeys to the Underworld, introduced long ago by the first people, are powerful currents within the Celtic psyche. The most potent experiences of a shaman vision quest often include a personal transformation – shape-shifting into the animal itself. Shamanism can be found in every hunter-gatherer culture around the world. The Shaman is a priest, a healer and a magician – a link between the living and the Ancestors, this world and the Otherworld. Shamans journey to the spirit world in altered states of consciousness, seeking transformation and healing as intermediaries for the tribe. 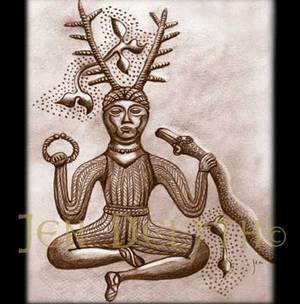 The typical half human, half animal painting of an antlered man from Les Trois – known as The Sorcerer – is our earliest rendition of a shaman. He is an ancient example of the transforming and shape-shifting that appears later in Celtic mythology. This figure of Cernunnos is from the Gundestrup Cauldron, a votive object found ritually dismantled in a peat bog near Gundestrup in Denmark in 1891. Made around the second or first century BC by the La Tène period Celts, this richly decorated silver bowl is covered in beautifully crafted images that relate to Celtic rituals and deities – including the antlered man, whom we first encountered upon cave walls more than 10,000 years earlier. He is depicted with magical plants – perhaps used as ritual medicine to aid in his journeying.